A friend of mine emailed me with a prickly holiday dilemma. She lives in Northern Virginia and has taken her daughter Rachel to visit Santa at the Tyson's Corner mall for the past five years. Not just any Santa, but the "real Santa" as pictured on the left. Except this Santa was laid off! Rachel understands the slew of Santas in other stores are substitutes but believes this Santa, with the real beard, red chubby cheeks, and twinkling eyes is the real deal. So my friend Michelle is unsure what to do? Her daughter is only seven years old. Does she tell Rachel that he only visits other malls and will never return to Northern Virginia but still come down her chimney with gifts if she's a good girl? Or does Michelle tell Rachel the truth now that she's increasingly suspicious and smart to say the least? My children have not reached the age to learn that Santa is a symbol and motivator for children to behave well for Santa to bestow them with gifts as a reward. So what happened to Santa? In these turbulent economic times, even Santa gets laid off. Yes it's true. 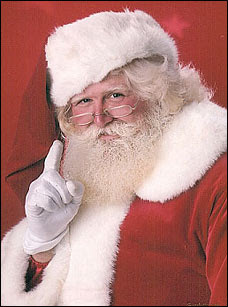 A popular Santa in Northern Virginia (his real name is Mike Graham), was given a pink slip instead of a red suit. But wait, another Santa was going to replace the Santa with the real, white, snowy beard. Like Santa who works in the north pole, and travels the globe to fill stockings of children with care, Mike Graham actually lives in Tennessee as a carpenter and works the Christmas season (a total of five weeks, seven days straight) in Virginia listening to children share their wish list. This particular Santa is known for his notable patience, wit and humor with children. The Washington Post ran the article back in October and the news spread faster than the speed of Santa's sleigh of reindeers --that's a lot of countries in 24 hours to give you an idea. According to the story, the management company of the Tyson's Corner mall, hired a new photo company and the two agreed to pick a new Santa. So Blog Sisters has a couple of theories. One, if you look at Mike Graham's publicity photo--he's the perfect Santa. But when was it taken? If Mr. Graham has served as Santa at Tyson's Corner mall for 18 years, and is now 51 years old, has time taken its toll on his appearance? Are his cheeks rosy or weather gray? Do his eyes twinkle or simmer like charcoal? Yes, it could be all about looks. Let's face it, Models are hired first for looks. Theory two: MONEY. Mike Graham was paid $30,000 for each season, -- this ain't no stocking filled with coal for working 7 days x 5 weeks straight--that's 35 days. Money talks and according to the new photography company, Santa's earn an average $17/hour. But Mike Graham invests in three costom made, red velvet Santa suits each costing $900 a piece not including the boots. We assume he has to pay for room and board nearby. According to the article, two generations of families have sat on the knee of this Santa who enamors all. We predict this story is far from the Grinch stealing Christmas. Rather, tradition, a long-time and cherished tradition of Santa and the Christmas spirit will prevail one way or another. What do you think?? POST A COMMENT BELOW!!!! Alicia, this is your blog sister here. Wow--I can't believe the story. I actually met this Santa when I used to live right across the state line in Maryland. He was incredible with the kids. Not sure what advice to give your friend as I don't have kids. From my own personal experience my parents never told us there was or was not a Santa. I believed in Santa for a brief time and soon figured it out the truth. But it was not heartbreaking. Going to church regularly we understood the real meaning of Christmas --about a special baby born to save us. We knew our parents bought the gifts but that baby Jesus provided for us. But my sister and I still would sit on Santa's lap to tell him our list outloud so our parents would hear it. People always hate to talk about when they are laid off. But as it has become every day's news headline since Yahoo started it with cutting 1500 of its task force last year, now a need of platform has been in demand where people can express their selves in words how they are feeling about their company, whey the got laid off was that justified or not. And every thing they want to tell anonymously.And www.layoffgossip.com is providing you that platform.